Norton Internet Security - a comprehensive antivirus and firewall that protects your computer, local network, online activities and your personal data, using innovative technologies to deal with aggressive modern threats. powerful and fast protection against malware and online threats without slowing down your computer. Improved Norton Protection System with layered security technologies that work together, provides comprehensive protection. New versions of products have got an interesting opportunity: mobile interface, and system Norton Management, allows access to the product via a browser that makes it possible to remotely scan of your computer without direct user intervention. Also received news software Download Insight, designed to check for malicious visited hyperlinks, and startup programs on the subject infected by a hacker code. In addition, Internet Security got the opportunity to control the bandwidth of the Internet channel, so the user can give priority to a particular application. * Norton Protection System - provides a powerful 4 unique level of protection to proactively blocking Internet threats before they can infect your computer. * Insight - checks the source file and the time of their existence on the internet to stop new online threats before they give you trouble. * Download Insight 2.0 - protects against dangerous applications, warning before downloading the program, that it may harm your computer system. * Norton Safe Web - protects you while you use the Internet, alerting and blocking dangerous malware and fake websites right in your search results. * Norton Management - Product Management Norton Internet Security 2013 is based on the cloud, so you can download, install, update and extend the anti-virus, in any place where there is Internet access. * Parental Control - allows you to monitor the activity of children on the Internet using Norton Online Family, so you can protect them from online threats. * Network threat protection - detects threats as they appear in the network and eliminates them before they harm your computer. 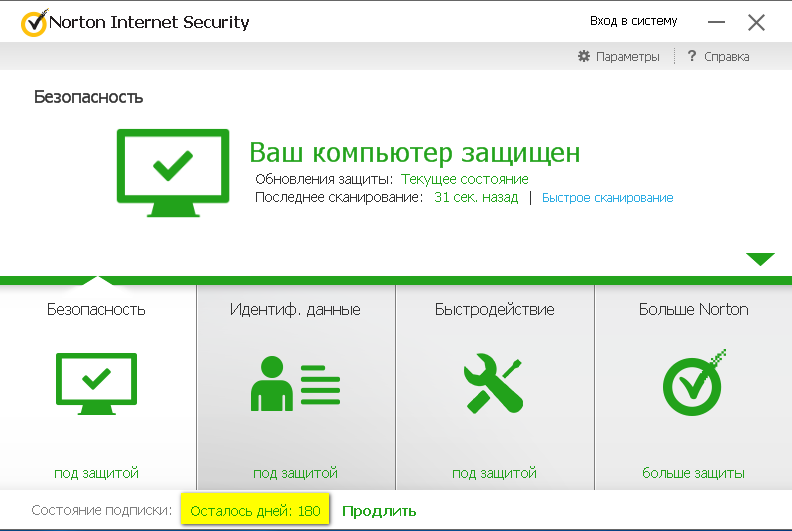 * Web Browser protection - protects, checking and blocking online threats. ATTENTION!!! To apply the key for version 2016 - 2019, you need to log out of the account created when installing N 360 and enter the purchased key. Attention!!! If you have the inscription "INCONSISTENT ACCOUNT" - "click": "USE THIS KEY"
After payment you will receive a personal key for NIS 2011/2014 5.5 months (164-165 days) for 1 PC. We hope you enjoy our service and you leave positive feedback for us and our product.